Sup, I'm SonicFreak also known as DJ SonicFreak from the YouTube community. I do Sonic remixes and stuff over there, so check me out. Anyway, I recently got back into drawing and will be posting Sonic artwork up. 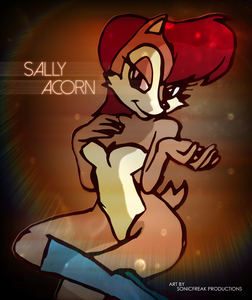 Mostly Sally Acorn art and maybe some Rouge and Vanilla (as they're my favorite Sonic females). My style is mostly inspired by CCN aka Chad the Cartoonut, so you might see some resemblance. Anyway, if you dig my stuff, feel free to comment and watch.